Skid steers and track loaders can be found in a multiplicity of markets. Farming. Road work. Landscaping. Snow removal. My personal favorite: Stevedoring — the loading and unloading of cargo ships — which can be done with a skid steer and a remote-control operating system in precarious aggregate-moving applications. 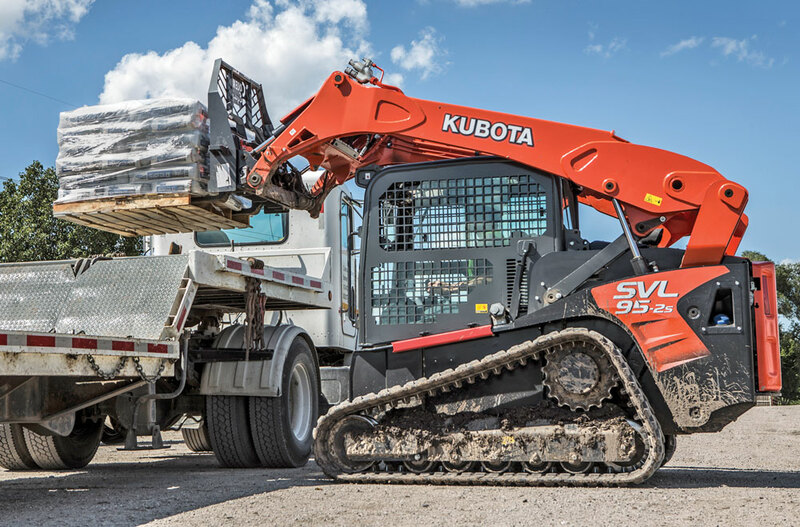 The diversity of skid steers and track loaders comes from their ability to wield hundreds of different attachments (from breakers to brooms). Adding to that diversity is an expansive market of at least 16 major brands of skid steers and track loaders being sold in North America in 2019: ASV, Bobcat, Case, Cat, Gehl, JCB, IHIMER, John Deere, Kubota, LiuGong, Mustang, New Holland, Takeuchi, Volvo, Wacker Neuson and Yanmar. Most of these manufacturers offer large product lines. Two quick examples: Bobcat offers 12 skid steers and nine compact track loaders, and Mustang offers 10 skid steers and six track loaders. The market supports a wide variety of models that come with a wide swath of technologies and options (attachments, boom orientation, high-flow hydraulics, backup cameras, joystick controls, grade control systems and onward). While the traditional wheeled skid steer has been a staple on jobsites for 60 years, today track loaders (engineered with a dedicated track undercarriage) are more popular in sales. A variety of unit sizes, reputable brands, high technologies and operator amenities keep owners and operators coming back to both wheeled and tracked units. Let’s learn why. There is a large span of model sizes in today’s skid steer and track loader market, usually broken into small-, medium- and large-frame categories. At the top, brands like Gehl and Mustang (each owned by French-based aerial lift equipment expert Manitou) tout “the world’s largest skid steer.” Gehl’s is the model V420, and Mustang’s is the 4200V. Both machines feature a powerful Deutz 97.2-net-hp engine and 4,200 lbs of rated operating capacity. 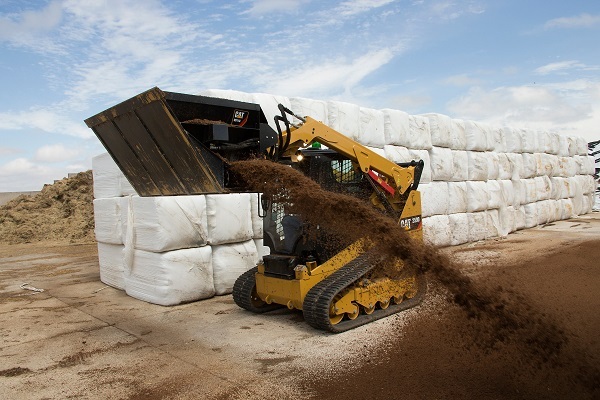 With an operating weight of 11,665 lbs, these extra-large skid steer loaders utilize a vertical-lift path of almost 12 ft for excellent dumping and loading performance. That’s one of the reasons Takeuchi launched its radial-lift TL6R track loader last year with a 65-hp engine, 7,400-lb operating weight, 5,269-lb tip load and max lift height of 9 ft, 6 in. The TL6R is under 6.5 ft tall, and it’s only 5 ft wide — a mid-frame model with a great size-to-power ratio. The TL6R’s 2,635-lb rated load capacity is a little bigger than the most popular size range, which is mid-frame skid steers and track loaders in the 1,750- to 2,200-lb rated load capacity category. Pressurized oil and fluid mechanics (i.e. hydraulics) power skid steers and track loaders. Hydraulic flow to the auxiliary circuit and the attachment will be determined in gallons per minute (gpm) and as standard- and high-flow configurations. 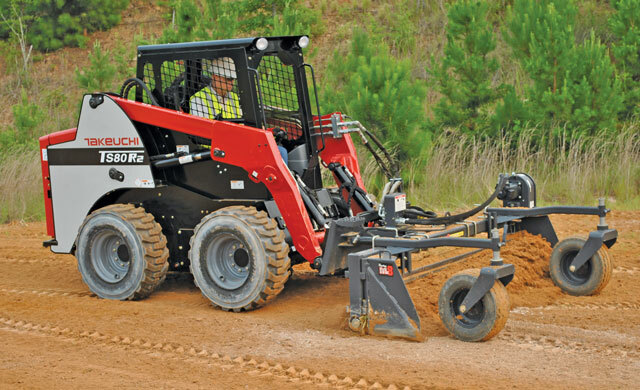 Skid steers and track loaders can boast up to 45 gpm on the largest “high-flow” models, powering aggressive implements like brush cutters, asphalt planers and trenchers. There are hundreds of different attachments to choose from and then a zillion different sizes. Like Boerger mentions, the flow and pressure of the attachment need to be compatible with the machine or there is risk of damage, premature wear and poor performance. Some of the most popular attachment categories include buckets, breakers, brooms, augers, pallet forks, backhoes, mowers, grapples, planers, blades, snowthrowers, tillers and trenchers. Mulchers and grading systems are two of the trendiest categories for skid steers and track loaders right now, but the variety of implement choices is only limited by manufacturer and customer creativity. Opulent cabs and high-tech controls are increasingly popular commodities on today’s skid steers and track loaders. Cabs are now considered all-day offices with pressurized cabins, air-ride and heated seats, air and heat options, satellite radio and ergonomic controls that make operators feel like they are in the driver’s seat of their own car. Some loaders even have the option of a backup camera. Low-effort, electro-hydraulic (EH) controls have grown in popularity with the ability to switch from ISO, H and foot patterns. We highly suggest you read our following story focused on new skid steer and track loader technologies starting on page 28. Many of these new operator stations come with sophisticated digital control panels that allow for attachment and machine automation. Routine tasks such as boom settings, attachment speeds, hydraulic flows, wheel speeds, ride control and return-to-dig functions can be automated into your joysticks, which are engineered into the armrests, which can be adjusted for your perfect comfort level. Digital interfaces allow operators to individualize and save these machine settings, change languages and add security measures. Telematics systems can be installed to track and log all machine functions, spearhead maintenance schedules, perform security measures like geofencing and (eventually) help operators operate better. Unfortunately, we can only discuss so much in this article, but there are lots of other options for skid steers and track loaders such as two types of lift patterns. 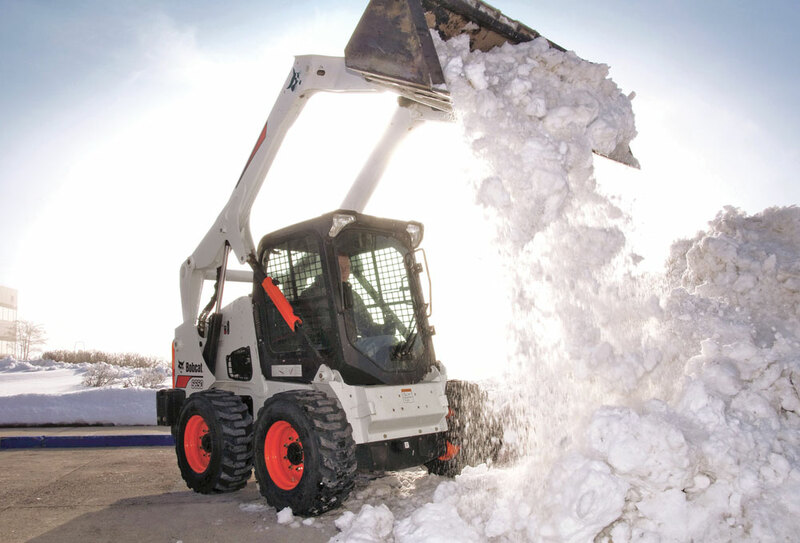 A variety of skid steer tires range from pneumatic to solid to foam-filled to airless options like Michelin’s Tweel. Then you have tire tread patterns like all-terrain, smooth, mud, turf and hard surface. For a track loader, overall undercarriage style including rigid, roller and torsion axle varieties should be a topic of discussion. Owners can choose from track treads with descriptors like general duty, turf, smooth, aggressive and premium bar or block. There are also wide and steel track options. Tier 4 Final diesel engines will be engineered into all new skid steers and track loaders, so it will be important to discuss the aftertreatment technologies on these engines, including emissions-reducing exhaust filters known as diesel particulate filters, or DPFs, which require periodic cleaning (regeneration) and selective catalytic reduction, or SCR, technology on loaders over 75 hp that requires the use of an extra liquid called diesel exhaust fluid, or DEF, at about one-third the ratio of fuel. Then, buyers should move onto understanding applications and specifications. Major spec categories include operating weight, tip load, bucket breakout force, engine horsepower, ground pressure, hydraulic flow and lift height and orientation. Consider the types of surfaces the machine will be operating on and the major applications planned. Operating a variety of machines is always smart, and rental is a great place to do that. Harder and abrasive surfaces are not very rubber track friendly, therefore the rubber tire machine vs. the rubber track machine is better suited for those conditions. Consider the application where ground disturbance may be important. Nurseries and golf courses, for example, lend themselves to rubber tracks where the lower ground pressure would cause less ground disturbance. When working on highway roads and bridges where road speed and the use of grinding attachments are essential, wheeled machines should be considered first. It’s important to understand that track units are more expensive, albeit that gap is lower than it used to be. Contractors should also expect that maintaining a compact track loader takes a little more time and effort than a wheeled unit with proper daily cleaning of the undercarriage. Didn’t get enough skid steers? Click here. For more track loaders, click here.